The largest crane system constructed to date by J D Neuhaus has been delivered to Westcon Lofteteknikk AS (WCL) of Norway for use on an offshore drilling rig. The semi portal design comprises an A-frame supporting twin overhead horizontal track beams providing a 7.5 meter span. The crane has an approximate height of 11.5 meters with a total weight of 32 tons. It is equipped with JDN hydraulic EH 40-H monorail hoists operating on each of the twin beams, each hoist providing an individual lift capacity of 40 tons. These hoists can be operated individually or simultaneously from one control, and when used in conjunction a total lift of 80 tons is possible with a 12 meter lift height being available. A JDN Profi 6 TI-H hoist with 6 ton lift capacity is also provided to cover other operational or service requirements. The whole energy supply system, which was designed and manufactured by JDN, incorporates four hydraulic drives provided for the crane travel movements. An electro-hydraulic switch cabinet is also mounted on the access gangway. The primary radio crane controls also have a back-up system fitted to cover any radio control panel failure. Manual operation is also accommodated to cover any unscheduled loss or failure of the electric power supply. The crane has been designed to comply with offshore operation, at temperatures down to -20ºC. 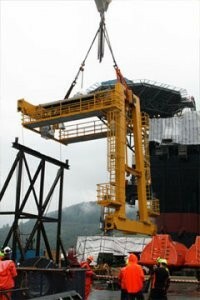 Survival conditions can also be maintained in the event of inclines from the horizontal of the rig of 3º with the crane loaded or 27º when unloaded. Operation within potentially hazardous environments is accommodated with an Ex-Classification of Ex II 3 GD IIB T4. A special safety feature is incorporated with the crane to cover any disruption to or total loss of the main power supply. This feature comprises a back-up hydraulic pump with fluid reservoir tank to provide emergency lowering of suspended loads, together with safe positioning of both hoist trolleys and crane.